The Department of Recreation and Wellness at Bowling Green State University has found a creative way to engage University departments and organizations as well as the community of Bowling Green, OH. Falcon Fitness On Demand offers private fitness classes to various University and community groups in a setting of their choosing. Residence halls, student organizations, local school groups, athletic teams, and other campus-affiliated and community groups have utilized this program to serve the common group and individual participants. Certified group exercise and personal training staff travel to the selected location to facilitate a private class, allowing for a fun and unique networking and team-bonding opportunity. 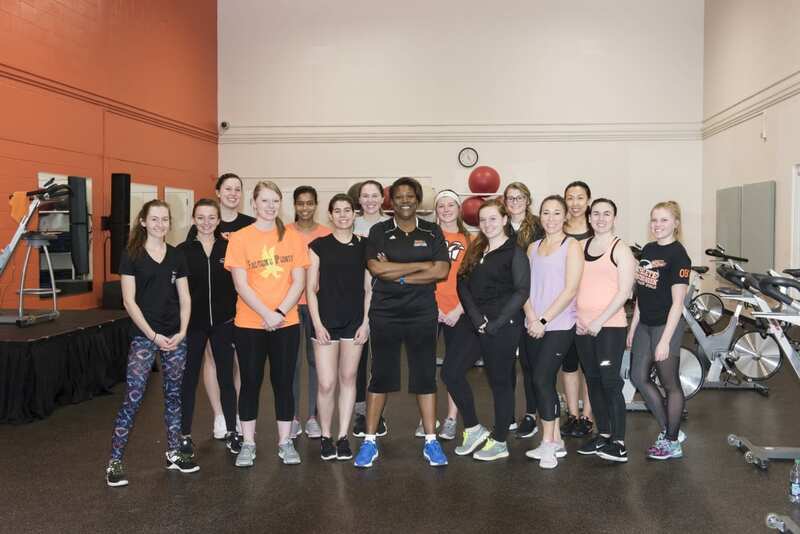 Adrienne Ansel, BGSU’s Graduate Assistant for Fitness, gave us the rundown on how Falcon Fitness On Demand has impacted the campus community and the success of the program. The program started within the last two years as a way of branding the outreach events the Department was already doing across campus and in the community. After developing a quick and easy way for groups to register for an On Demand class, BGSU has seen growth in the number of scheduled classes and partnerships across campus and community. “We offer any of our current classes (including PiYo, Zumba, Pound, Total Body Burn, and Late Night Candlelight Yoga). We navigate space and equipment needs based on the request,” shared Adrienne. While the need for equipment and a suitable space seems like a major hurdle to this type of program, she says it is something the fitness staff has been able to work through to give participants the best experience possible. Instructors do not transport any equipment outside of the Student Recreation Center; rather, as an example, they may advise participants to bring their own yoga mat if possible. If you are interested in reading more about Falcon Fitness On Demand, click here. Bowling Green State University is a public research institution with around 19,000 students. The Department of Recreation and Wellness has 13 full-time staff and seven graduate assistants. Along with the Student Recreation Center, the Department operates Perry Field House, outdoor intramural fields and a mud pit, which is used for events such as mud volleyball and tug of war. BGSU’s unique services do not end with Falcon Fitness On Demand, but also includes HIV Testing, Falcons After Dark late night events, and their Freshman Wilderness Experience. Visit their website here to learn more about each of these incredible programming opportunities.